• The two outer, exposed surfaces may be smooth or textured. 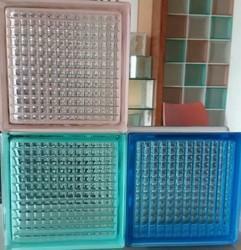 • Glass blocks can be coloured and have decorated surfaces. 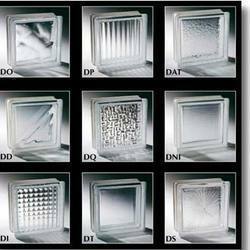 We are offering Clear Cloudy Glass Bricks. Glass Brick, Size: 8" X 8" X 4"
Matching up with the ever increasing requirements of the customers, our company is engaged in providing Glass Brick. Owing to our state-of-the-art infrastructure facility, we have been able to provide Glass Brick. Our offered bricks are manufactured utilizing high-grade glass by our vendors in tandem with the guidelines laid in the industry. In order to ensure perfect finish, the offered bricks are checked on various parameters. The clients can avail Glass Bricks that are manufactured via regulated thermal treatment, which increases the strength of the material compared to normal glass. This product does not crumble into sharp-edged fragments if broken. We adhere to the highest national and international standards while developing the product line to ensure superior strength, fine finish and durability. Chawla Float Glass is reknowned Supplier of Glass Bricks. Glass brick, also known as glass block, is an architectural element made from glass.Glass bricks provide visual obscuration while admitting light.Glass bricks are produced for both wall and floor applications. As an illustrious corporation of the industry, we are eagerly immersed in presenting a broad gamut of Glass Bricks to our patrons. With rich industry experience and knowledge, we are committed towards offering an excellent quality range of Glass Bricks.